On March 15, TRUST MACHINE: THE STORY OF BLOCKCHAIN, the Breaker and Futurism-produced documentary that chronicles the rise of hacker culture and the application of blockchain technology around the globe, will digitally premiere exclusively on Breaker. In the meantime, the film continues to screen theatrically, most recently at a buidler-heavy audience at the Alamo Drafthouse in Denver as part of ETH Denver’s BUIDL Week. The film was originally conceived as one of the four goals outlined in the Breaker (formerly known as SingularDTV) Token Generation Event (TGE). Other goals included the creation of a royalty/residual management system via tokenization and an entertainment marketplace, both currently running in beta as Tokit and Breaker’s desktop app, respectively. The original impetus for making the film was a lack of quality content exploring blockchain in a nuanced way, something that still holds true today. Film as a medium is an accessible, empathic art form, one that allows for blockchain neophytes to more easily learn about this revolutionary technology and people using it in their own lives. A film, we thought, could be the perfect tool to educate artists and fans about blockchain and champion its use to solve problems plaguing many industries, including the entertainment industry. But in recent months, we have identified an additional educational use for the film: an opportunity to not just tell our community of token holders what we’ve built, but to show them our work in action. Accordingly, Breaker will be treating all our SNGLS holders as stakeholders in this film in order to allow all our token holders to learn a little bit more about the entertainment industry, allow them to interact with each part of our ecosystem, and even gamify word-of-mouth marketing. Breaker is going to create a new token via Tokit to represent all revenue generated by TRUST MACHINE. This token will be called the Trust Machine (TRUST) token. 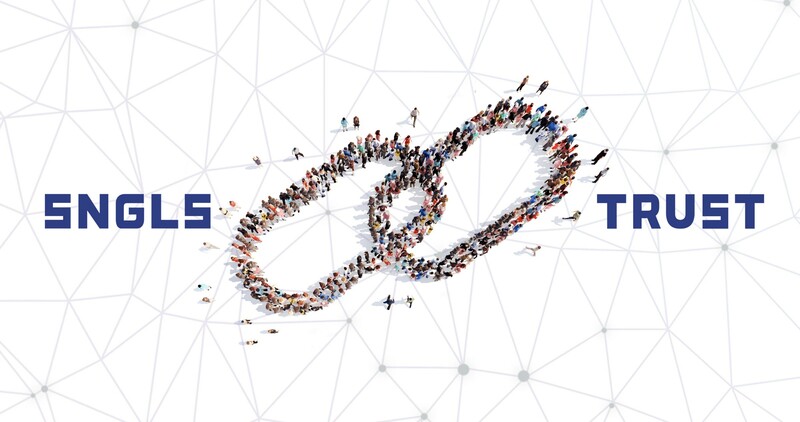 We will create one billion TRUST tokens to equal the number of SNGLS tokens in existence. Just like SNGLS, 600 million TRUST tokens will be available to the public, while 400 million will be reserved for the Breaker treasury. We are debuting a new waterfall smart contract with the Trust Machine (TRUST) token. In the film finance world, a “waterfall” refers to who gets paid out what amount when. Typically, a few stakeholders will claim the right to be paid out a certain amount before any other stakeholders in the film get paid, allowing those stakeholders to recoup the film’s budget and/or marketing expenses. For TRUST MACHINE, we are implementing the following waterfall: our SNGLS holders will be given the right to be paid out the first million dollars that film grosses before anyone else, including Breaker and our creative partners. After that point, our token holders will have to split revenue from the film with Breaker and our producing partners at Futurism pro rata in accordance with the percentage of tokens held by each group. In order to receive their stake in TRUST MACHINE’s waterfall, SNGLS holders will need to claim Trust Machine (TRUST) tokens. We will take a snapshot at block 7368000, scheduled to be mined on March 13, so be sure to move your SNGLS tokens off exchanges and into a wallet you control in order to participate. For every one SNGLS token you have in a wallet you control and mange at block 7368000, you will have the ability to claim one Trust Machine (TRUST) token. Tokens will not be airdropped, but rather earmarked for token holders. The 600,000,000 TRUST tokens will be moved to a custodian smart contract. Eligible wallets will be able to claim their Trust Machine (TRUST) tokens from this smart contract via an interface in their Tokit dashboard. Breaker suggests using a lightwallet created using the Tokit interface or a MetaMask-compatible wallet to make this process as seamless as possible. Trust Machine (TRUST) tokens will be claimable from Tokit on March 15, two days after the snapshot and the same day that the film digitally premieres on Breaker. Eligible users will need to input a name and email address here to receive tokens. Be sure to use an email address you actively check — we’ll also be emailing you a coupon code for one free purchase of TRUST MACHINE so you can check out the film yourself. Eligible wallets will have one year to claim their Trust Machine (TRUST) tokens via this Tokit interface, at which point the tokens will revert to Breaker. Eligible wallets are only able to start claiming revenue from TRUST MACHINE after they have TRUST tokens in their wallet, so do not delay. If you collect your tokens late, you will only be able to collect revenue generated by the film AFTER the tokens arrive in your wallet. Whenever revenue is deposited into the TRUST revenue smart contract, it will be split up among all the TRUST tokens claimed from the custodian smart contract. For example, if 400,000,000 TRUST tokens are claimed on March 15, each of your TRUST tokens will enable you to receive one four-hundred-millionth of the revenue generated by the film’s downloads that day. Our waterfall smart contract will ensure that the remaining 400,000,000 Trust Machine (TRUST) tokens set aside for Breaker and our producing partners will not receive any revenue until the aforementioned million-dollar milestone is reached. After the million-dollar milestone, each TRUST token will be entitled to one billionth of the revenue generated by the film. All theatrical revenue to date will be converted to ETH and sent to the TRUST smart contract for TRUST holders to withdraw. All revenue generated by the film on Breaker will automatically be sent to the TRUST smart contract for token holders to withdraw. Remember, the goal here is education and discovery. No one should be expecting to get rich off a documentary on a “niche” subject. Instead, the Breaker team is eager to see what happens once we give the film away to you, our community, at which point you all will become TRUST MACHINE’s word-of-mouth marketing team. TRUST MACHINE and the TRUST token is effectively an experiment in film finance, an incentivization of blockchain evangelism, and a stress test of the Breaker ecosystem all rolled into one. We’re excited to see what we might learn together. Confused about any of this? Want to join in the discussion? Come say hi in Discord or on Reddit to learn more about TRUST MACHINE, our DApps, film finance, and more. For the latest Breaker news, you can also subscribe to our newsletter here.